Jump to my recipe HERE or stick around for my ramblings. We have a pretty awesome Farmer’s Market here in our town. Sadly, we’ve lived here for six years and I’ve only been there once. Once! I had the best intentions of always going, but something would come up, or I’d put it off and just never made it there until last month. I met my friend Mel there and we walked through the place a few times. She’s a frequent farmer’s market shopper so she showed me all the ins and outs. We went there on a Saturday, which is their busy day and the place was buzzing with beautiful vibrant colors of fresh grown fruits and veggies. Baked goods, roasted pecans and all sorts of tasty foods filled the air as you walk through the market. Friendly greetings from customers and venders filled the air and the place just bellowed with a good feeling. Along with the foods and produce, there was beautifully made jewelry, crafts, and gifts. The flowers at multiple booths seem to wave at you as you walk by. 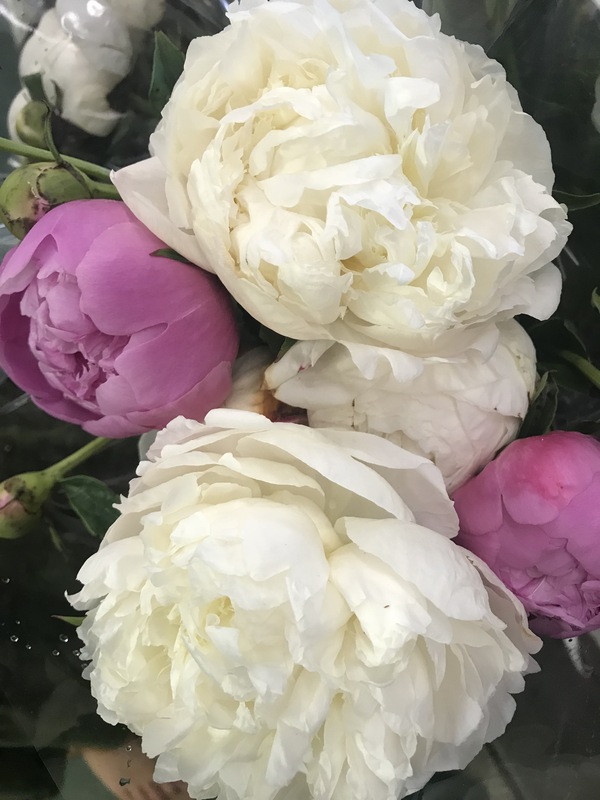 If I didn’t have a sneezy prone husband and daughter, I’d for sure be filling up some vases with those beauties. 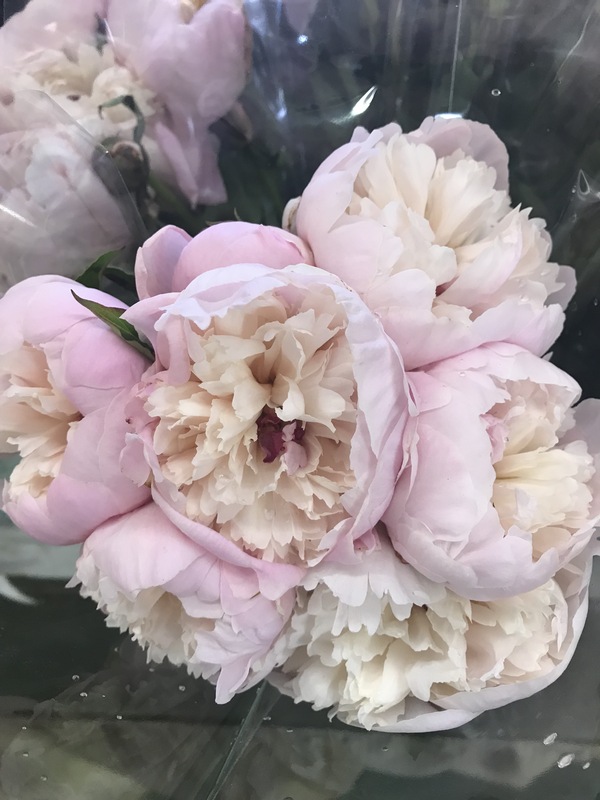 There’s so much variety from fresh herbs to delicate peonies, zinnias, daisies, and more. Mel picked up some fresh flowers like she often does when she goes to the farmer’s market and I scored a potted fresh herb arrangement. I’ve somehow managed to keep the thing alive, which is surprising. I’m getting lots of use out of the basil and thyme especially! There is lots of fresh produce from local farms. There are vendors with meats and cheeses from farms and dairies and all kinds of hand made treasures. 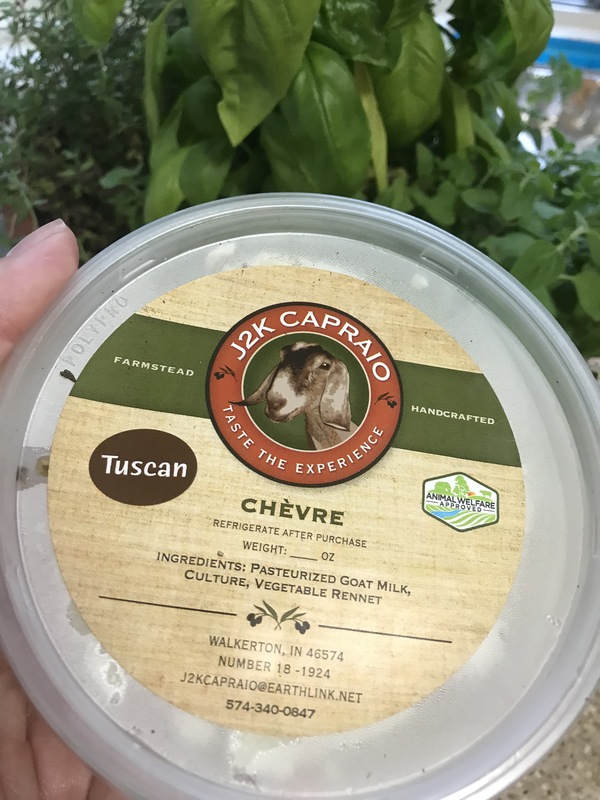 I picked up some yummy goat cheese from a local farm. Such a treat! One item we both were on a mission to buy were little cucumbers so we could make refrigerator pickles. We found a vendor with some beautiful fresh green cucumbers ready for pickling so we bought them up. He scored some bonus points in my book because I know his family through our church. They are a great family and friends of ours so I think that makes the pickles taste extra good. 🙂 If you are up in the SW Michigan area – check out Vite’s Greenhouse and Vite’s Produce at the South Bend Farmer’s Market. There is a little cafe that features locally sourced ingredients and tasty treats. My friend and I enjoyed our lunch catching up and making our plans for all the yummy things we wanted to make in the kitchen. She loves to cook and share great recipes. She’s so creative and fun to be around and we love talking on our long lunch dates. I can’t wait to head back to the market and get some more goodies. 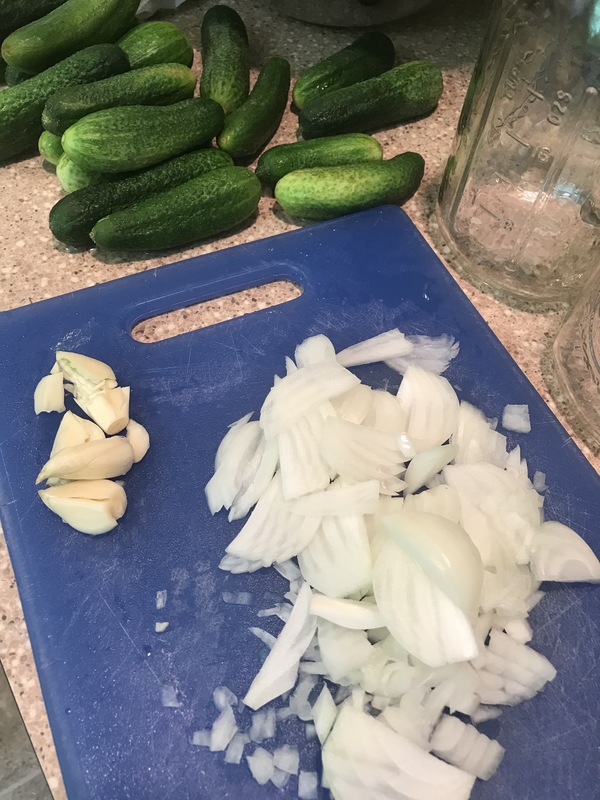 The pickles: Let me preface this by saying this is my first time ever making pickles. I was aiming to recreate the yummy dill pickles that I pick up at gas stations. 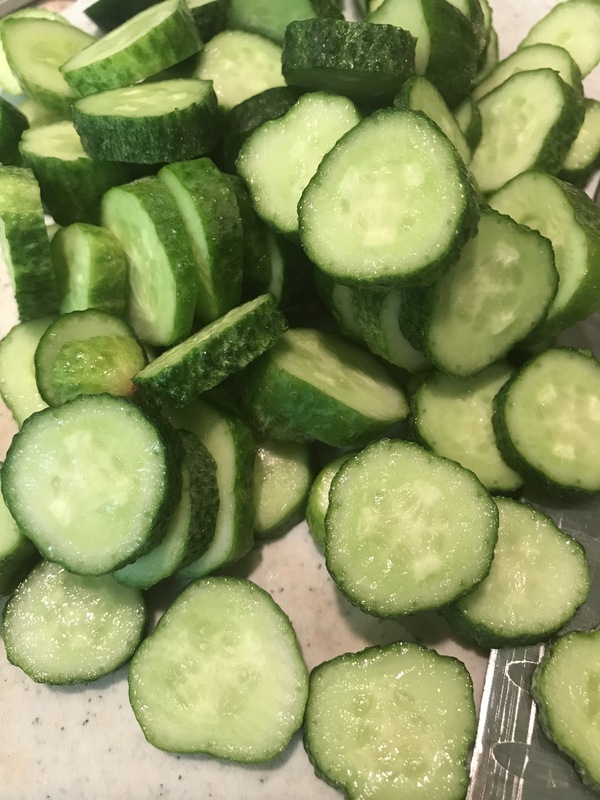 Some grocery stores carry them, but they are sometimes the large pickle and not the slices, or they are the spicy flavor and not the dill. I prefer the dill sliced ones so I always grab them when I can. Nothing better than drinking the remaining pickle juice from the pouch as you drive down the road! Ha Ha! They come in a pouch and are so crunchy and fresh tasting. I’ve always wished I could buy those by the case so I’d have them on hand, but now that I’ve made my own and they are just as tasty, I won’t have to worry about it. These homemade pickles are super crunchy and need to be kept in the refrigerator. They can really be made in any jar or vessel, but I like them in a large quart sized wide mouth mason jar. They are not sealed in the jar like when you are canning, so keep that in mind and always keep them in the refrigerator. They will last for about 10 weeks in the fridge. I don’t think ours are going to last that long and I am all ready to make another batch as soon as I return to the market. 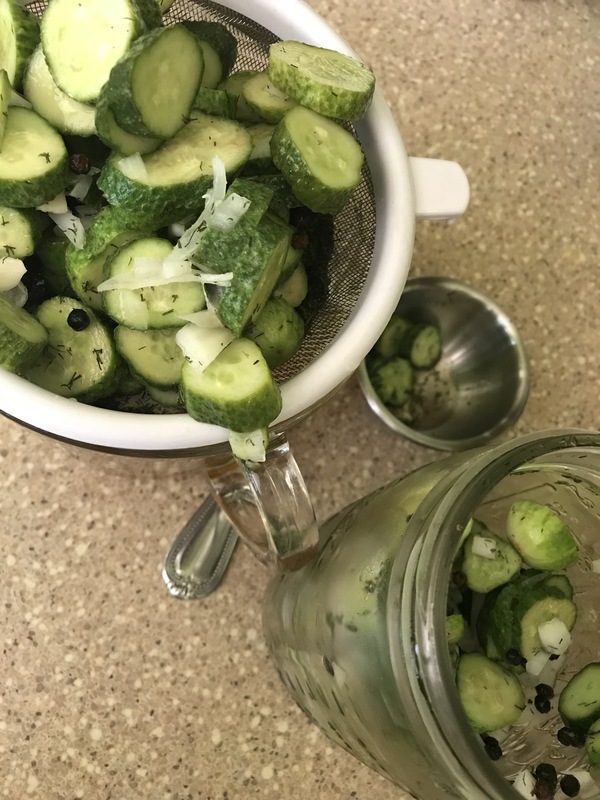 I used about 20 small cucumbers and that was enough for three Quart sized jars full of sliced pickles. Make sure you use Wide Mouth Jars so it’s easy to retrieve your little yummy pickles. And make those kids use a fork, not their grubby fingers! 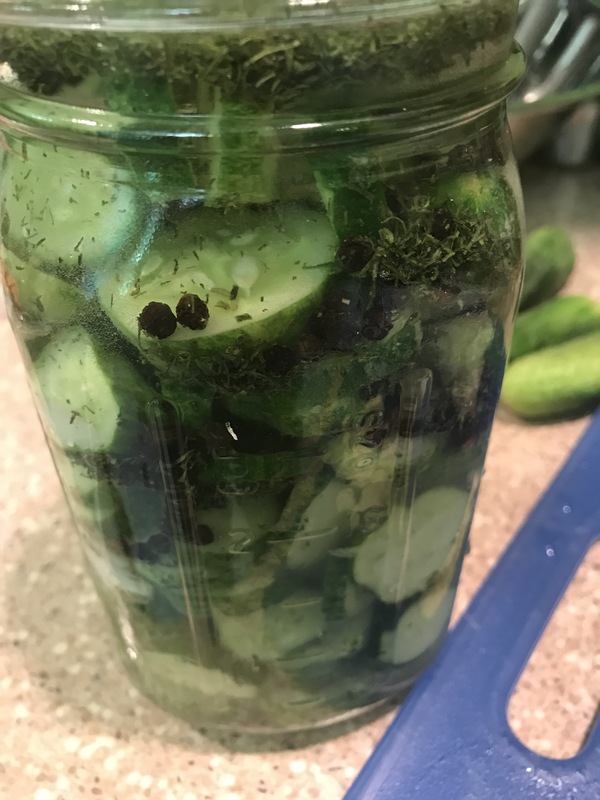 What I learned on my first round making pickles: Next time I make mine, I’m going to use dill seed instead of dill weed. I only had dill weed on hand and didn’t want to delay making my pickles any longer so I just went with it. 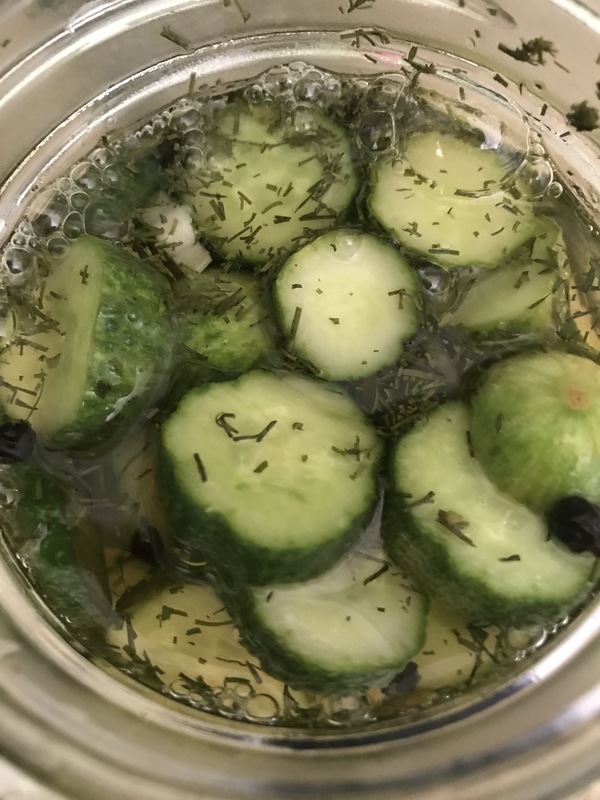 However, the dill weed is a little well, “weedy” and I ended up straining the pickles after they had marinated overnight. This helped to get rid of a lot of the actual dill weed and some of the onions and peppercorns, but the flavor still remained in the brine. I left plenty of the dill weed in there and they tasted great. My husband wants me to try a spicy version some time. So I’ll have to play around with marinating some peppers in with the mix, using less dill and coming up with a sassier pickle flavoring. I can’t wait to experiment! This recipe is per jar. If you want to make a bigger batch, like me- then double or triple everything. I think it’s best to measure the brine ingredients per jar, rather than in a big batch if you are making more than one quart of pickles. That way each jar is consistent with it’s own spices, flavorings, and brine. Wide Mouth Quart sized jar(s)- 32 oz. 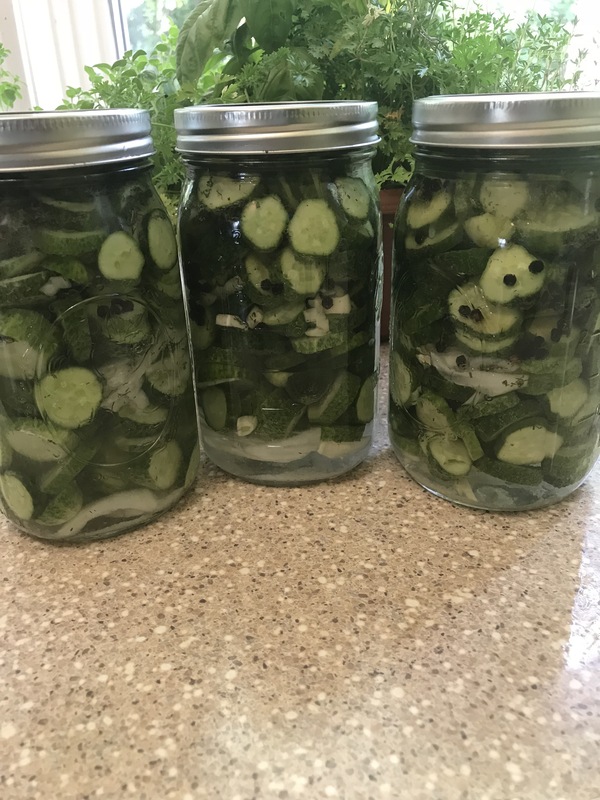 6-8 small pickling cucumbers. Rinsed and sliced. I like mine around 1/2 inch thick or so. ***You can add more or less dill depending on how much dill flavor you want. Note- I did not have dill seed so that’s why there’s dill weed in my pictures. I will use dill seed in the future for less mess and so I don’t have to strain the pickles. Put a layer of sliced onions and minced garlic in the bottom of the jar. Add sliced cucumbers until jar is about half full. Add another layer of sliced onions and garlic. Add more cucumbers until just about to top of jar. Add Salt, Peppercorns, Dill seed/weed. Pour vinegar into jar until it’s about 1/3 of the way filled. Fill rest of the jar with water. Screw on the lid and refrigerate for at least 24 hours. 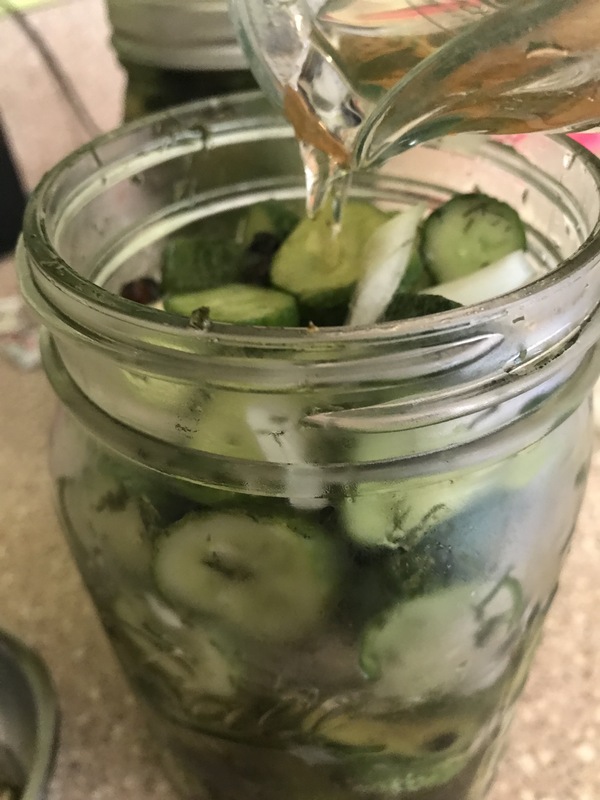 If you want to strain the pickles a bit to get rid of some of the dill weed, peppercorns, onions etc, after the 24 hours, you can pour the pickles through a mess strainer and then return the pickles and brine back to your jar. Pickles need to be stored in the refrigerator and are good for up to 10 weeks (if they last that long).